Diagnosed bipolar after a major manic episode in 2007, Conor Bezane was a successful producer at MTV News in New York. But after a layoff, he became an alcoholic while unemployed. His narrative of addiction and mental health is outlined in a new memoir. I’m sitting in an alley in downtown Chicago at 3AM smoking crack with Rashaad, a homeless guy who, although we’ve just met, instinctively knows I’m gay. We’re chain-smoking Newports and drinking a super-size can of Earthquake malt liquor in between hits from his crack pipe. It’s below freezing out. Dumpsters all around. The stench of garbage. Graffiti on brick walls — tags, not pieces. Rashaad admires my footwear — black Ted Baker London shoes. He wants me to step on his hand with all my might. He’s easily twenty years my senior, a Vietnam vet who readily confesses he enjoys pain. “Walk on me,” he commands. Not a suggestion, an order. I do it. I’ve always been a people pleaser. “No,” I say. Without pause, he leans over and kisses me. I’m so high that I don’t hesitate to kiss him back. As we’re swapping saliva, I can tell he’s an inexperienced kisser. He inserts his tongue deep in my mouth and moves it around, not delicately but aggressively. It’s a bad, sloppy kiss. Despite how awkward and unpleasurable the situation is, I let it go on for a good half minute, unable to find a polite way to extricate myself. After the kiss, Rashaad invites himself over to my apartment. That’s where I draw the line. At least there’s some sanity left in me. I feign fatigue and leave shortly after. I never see him again. I’ve been drinking every single day for the past five years. At this point, I’m rather certain I could outdrink Kill ’Em All–era James Hetfield of Metallica, a band whose consumption was so legendary in the ’80s that it earned the name Alcoholica. I’m also on seven different drugs for my bipolar disorder. My experience with recreational drugs is different from that of the normies (as those of us with mental illness often refer to the chemically stable members of society): Uppers bring me down and downers bring me up. That’s just how the drug-abusing experience is for me. Mixing recreational drugs with prescription pills is dangerous. I know better. But I’m living dangerously and I don’t care. Getting high has replaced all the career goals that once drove me. It’s my daily purpose, and I don’t let anything get in my way. I live in downtown Chicago in the upscale neighborhood of River North, where I moved in 2009 after getting laid off the year prior from my corporate-yet-creative job as a producer for MTV News in New York. In less than a year I’d spent all my severance on beer and wine and was forced to move back to the city where I grew up and where my parents still kept an apartment even though they’d retired to Hawaii. The apartment is riddled with artifacts from my childhood: family pictures, the same art that’s hung on the walls since my grade-school years, the same furniture since I left for college. I’m lucky I have a place to go. In fact, I’m kind of a spoiled brat — my parents are subsidizing my life, with the caveat that it last only “until I find a full-time job.” The job hunting has taken a backseat to my drinking — I haven’t even submitted a resume since I moved back to Chicago three years ago — making me a career alcoholic living rent-free on Mom and Dad’s dime. Thanks to the Great Recession and the media industry’s subsequent nosedive, I have a ready-made excuse for being unemployed. I’m drinking two six-packs or two bottles of wine every night. Sometimes I even go out late to scavenge for a third six-pack. The recycling bin on my floor of the building is perpetually chock-full of empty bottles of Blue Moon, my poison of choice. I long for the mania that so often comes with being bipolar, and being drunk feels almost like it. Mania can be fun — at least for a short time. But after a few months, it can get downright scary. You hear and see things that aren’t there. Take the worst paranoia you’ve ever experienced, multiply it by a thousand, and you’re still not even close. When you’re manic, you’re in a fantasyland, but one that exudes only darkness. Conor Bezane is a music-meister who has written for MTV News, AOL, and VICE. As a recovering bipolar addict, he can be found digging through the crates at a local record store when he’s not attacking his keyboard, writing nonfiction. 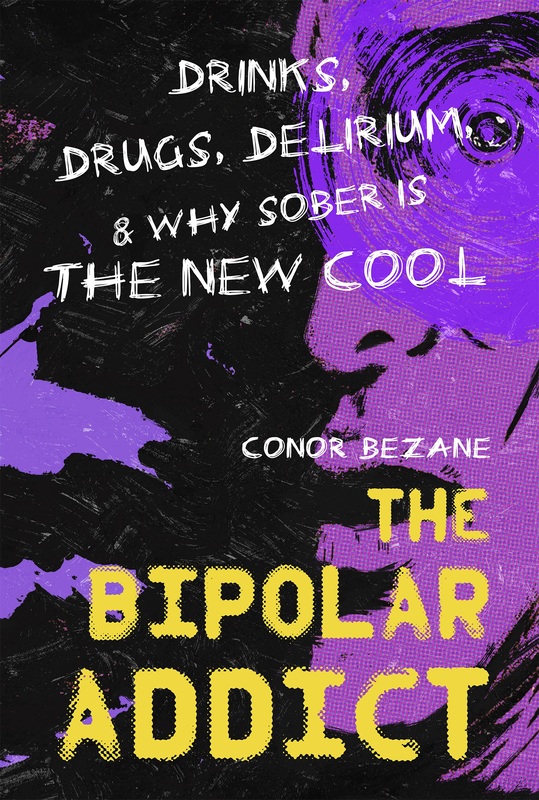 You can preorder his book The Bipolar Addict: Drinks, Drugs, Delirium & Why Sober Is the New Cool, due out June 21, on Amazon.